Despite the fact that the Switch has been selling like hotcakes as of late, actually outselling its main rivals to become the best-selling console of 2018 in the US, rumours and mumblings of a potential new model (or a price cut to the existing model) have been circulating for some time. Earlier this month, analysts shared their beliefs that Nintendo will release a new version of the console this year, potentially even going as far as to ditch the Joy-Con setup altogether as part of a 100% portable 'Switch Mini' system. While a change or revision seems likely at some stage, Nintendo President Shuntaro Furukawa has suggested that things are staying exactly as they are for now in a recent interview with Japanese publication The Sankei News. In the interview, Furukawa was once again asked about the 20 million Switch units goal for this financial year. We've heard his comments about it being "ambitious" countless times before, but the next part of the comment stands out here (translation via Nintendo Everything). Furukawa: "It is an extremely ambitious, but worthwhile achievement. So, we will maintain this goal. Nintendo Switch is our primary sales objective, and we are not considering a successor or a price cut at this time." So, not only is the 20 million units goal still very much on, but Nintendo appears to believe that it can be reached without any changes to its current strategy. If the console's still selling at a comfortable rate, perhaps any potential hardware revisions or price drops can be pushed back. 'If it ain't broke, don't fix it' - and all that. Were you expecting to see any price drops or new Switch models this year? What do you think will be the first change if and when it does eventually arrive? Share your thoughts with us below. Makes sense, the consoles only been out for 2 years at this point and hasn't even seen an updated model like most Nintendo systems get. I say we still got a few years to go. Any announcement now would harm sales. I reckon a mid-gen upgrade ala DSi, new 3DS in 2020 but only if sales start to slow. Hopefully this puts an end to the "Switch Pro" speculation. It's so annoying. Makes sense to me, whilst a revision will eventually come, in it's current form, the Switch is selling, breaking records and tracking at Wii levels. Why break with a winning formula. You know what? I'm fine with this. So long as it can retain it's specialty of portability, I think it'll do fine against the PS5 and next Xbox. I imagine most third parties aren't even halfway ready to jump to such ridiculously beefy hardware yet anyway. I wonder if Nintendo is scared of Soulja Boys revolutionary Soulja Boy Handheld system? It has 900000 games, all in 1 system. Nintendo should just give up all this Nintendo Switch nonsense. I just hope that when time comes for them to do an upgrade or a successor, it's backwards compatible. I have invested more money in games for the switch than I have ever done for any other console so far. I still don't buy the 100% portable revision bit. That's contradictory to what the Switch concept really is. I'd understand if they just make a smaller version. But a dedicated portable? Might as well switch the name. Just more CEO speak. Do you have any personal thoughts or opinions, Furukawa? People keep talking of a faster processor in the speculated pro version. The only real candidate for this is the Tegra X2, which no one knows if it can be produced in large quantities and if it makes sense financially. Anyone who expects a revision or a significant price cut at this point in time is an idiot. Plain and simple. It's obvious that they wouldn't want to kill their own momentum when it's this great. Captain obvious alert : of course they're not, until the day they announce it. So, what was that means for Revision on this year 2019 last time Nintendo said before? How long will it take before analysts realise Nintendo is not like the other companies? Just because Sony and MSoft cheapen their products by releasing a newer model, leaving the older ones inferior and suckering people into spending more money on a minor upgrade (Smithers: yes, but she's got a new hat, https://youtu.be/DaOgZwk9rN8 ) it doesn't mean Nintendo is going to do that. This doesn't really mean anything,of course they're going to say that. They have targets to meet and the thing is selling very well but that doesn't mean it won't happen.Remember they denied the speculation about the 3DS XL then a few weeks later announced it. History shows a revision is not too far off regardless of how well it's selling. They released the DS Lite less than 2 years after the original model came out despite its strong sales.I reckon early next year threre will be some sort of revision but wouldn't be surprised if it arrives in time for the holidays, especially if the PS5 launches this year. Doubtful, but you never know. My favorite part of this story: "outselling its main rivals to become the best selling console of 2018" Oh how sweet it is! @LavaTwilight When it comes to revising consoles Nintendo lead the way,at least with their handhelds. Also, the GameBoy line will not be discontinued. Would they admit it this early, though? I don't think so. And I'm afraid a revised Switch is still possible, making us early adopters have the oldest model, because it wouldn't be a successor technically. @KingdomHeartsFan I’m sure he does but his job is to speak the corporate speak, stay close to brand strategy. After all, a misstep or a careless phrasing can damage share prices, look at Elon. For me, I’m very happy with the hardware. Yes, some improvements can always be made but for the next year at least, I’d rather spend money on games, games and more games. @PipeGuy64Bit Preach. Why on earth does everyone want a Switch Pro? What is wrong with it as is? I didn't buy a console for it so become obsolete in a two year span. No problem with this. New iteration designs are probably already in the safe awaiting the go ahead but they tend to come out when sales begin to slide downwards. Why bother making current stock less valuable if its selling so well? @KIRO That's a good point. @janpampoen Everyone always wants more. More power, more battery, more pixels; at the same price. The Switch isn’t perfect but I’m happy in its current guise. A Switch Pro may make sense as a niche product but if the majority of people are willing to buy in its current guise, why should Nintendo spend more on R&D, manufacturing and supply chains for something that may make minimum extra profit? What would u expect. The guy saying "Yeah! We are going to annouce the new iteration this year! of course "
Of course they are gonna say this. They aren't gonna announce anything until they are actually announcing it. The minute someone says "We are considering releasing a newer model" sales on the current version will drop, because people will decide to wait for the new model. It happens all the time. @KIRO I was thinking the same thing as I typed New 2DS XL. I need Joycon revisions instead. I'd want a sturdier one. @ottospooky Totally agree with you as Furukawa said they are not considering a "successor" but that doesn't mean they won't consider a "revision". Interesting though that his pledge not to cut the price of the current model would appear to rule out the possibility of an upgraded Switch model. Nintendo wants this to become a "one per person" system, which isn't really feasible right now, even with as well as the system is selling. Consider how quickly we got revisions of the 3DS line, too, even after sales picked up: it took only a year and a half or so before a 3DS XL came out, and then, in four years or so, we got the New 3DS. Nintendo has a huge history of revising their portable hardware, and with the launch of Pokemon and Animal Crossing, it'd make sense for them to develop smaller and slightly cheaper Switch units that are primarily used in handheld mode. Of course, Nintendo will say they aren't developing a revision: they always say that, regardless of what's actually on the horizon! If they want to bring in more sales, then they really ought to implement a price drop. I know quite a few people who, despite being interested, have refrained from buying a Switch because of that ~$400 CAD price point. It's not exactly affordable. Although, I do suppose that's what the 3DS is still there for. It makes sense. Keep the Switch the way it is. Given its success do not confuse customers with new characteristics. I'm sure that a new iteration is in the works, like what they did with the different versions of the DS and 3DS. but they don't want to risk slowing down the sales of the current version by announcing a new version too soon. "switch mini" sounds so dumb, if I'd want to play a local 4 player game I'd need to purchase 2 sets of joycons. I could get on board with a switch pro though if the dimensions stay the same to ensure controller compatibility. @janpampoen You know having a hardware revision released doesn't eliminate your ability to enjoy what you already own, right? @PipeGuy64Bit As others has mentioned, this refers to successors, not minor hardware revisions as Nintendo has been known to do. Additionally, this is absolutely what they have to say until they are ready to announce something. Announcing something new is coming, or a price cut is coming, too far in advance would see short term sales drop off a cliff. He said successor... I think the Switch platform has ended the way Nintendo used to handle platforms. I see the Switch getting updated like Apple does with the iPads. Except they'll update internals every couple of years rather than once a year. However, I'm convinced there is a home console component to the Switch that should be coming out soon. A general reconfiguration or a deluxe model wouldn't as such be "successors" , and the latter would absolutely assist with keeping the pricepoint fair. So I think this is a carefully worded response to say as little as possible, and I wouldn't rule out anything. Yay! Now I don't have to feel the urge to upgrade when my friends have the better model! It's January, they shouldn't be thinking of a price cut now anyway. Before a price cut they'll bundle a new game at $299 rather than $359 like SSBU and Pokémon. But not until September or the holidays. Also, they need to start thinking about their Sony and MS competition. When do the new consoles launch? They need to keep some news to counter that news. Also price. If the new consoles launch at $499 Switch looks good at $299. If they launch at $399 or $299 then Nintendo can think about a proper response. Its 2019, there will be other news, Nintendo needs to plan for that. No reason to announce anything until then. Exactly what they say until the moment they say, here's a handheld only switch, and here's a switch 2. A bit like the third pillar next to the gameboy I guess. We'll see a newer switch soon enough. If momentum doesn't increase anymore it's gonna be bang: here's a hd-er, voice commy-er, battery-er switch. They can hardly tell us a revision is coming when they still need the current model to sell 20 million in the current financial year. I would be more surprised with a revised Switch. Nintendo will release a handheld ONLY version of the Switch this holiday season. So technically, they aren't lying when they say "there will be no successor or price cut anytime soon". A handheld only version that sold for $200 or $250 with a game would allow Nintendo to clear out their remaining stock of 3DS/2DS units at a reduced price while still having a handheld system on the market. @Painkiller_Mike Personally, I don't think they will sell a handheld only version, ever. I wouldn't mind being proven wrong, but to me, it just doesn't make sense. It doesn't cost anything for them to include the ability to dock - since whatever handheld only system they put out would still have the USB-C port for charging. I could see them selling a system with non-detachable joycon and with no dock included, but I would hope it's still compatible with the dock add-on purchase. Yeah I'm sure any revision would be backwards compatible just like New 3DS. The problem comes with those who have the older model and games start coming out that will only work on the newer model. Wow Troll farm are back again. Even though nothing said or mentioned they still talk about how they think it will be sold at lower price. People really think they will make a new product and not let it run older Switch games. Get a life people. If your whining about original 2DS cartridges not working in a 3DS - that was old tech the newer 2DS games can run on a 3DS because they fit the same slot made sense there since it allowed player to experience 3DS all over again. But others keep clinging onto Old Tech cartridge design and keep using it as though that was the standard. Yea, keep doing that and that shows why your not in R&D or any management positions for Nintendo. 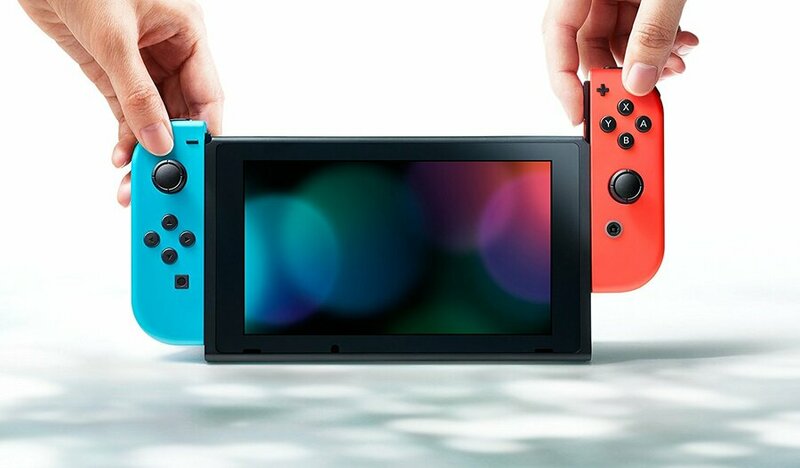 As I said before the price will be that until they if 5 or 10 years down the line produce a Switch 2.0HD which is in the cards with upgraded screen and GPU that will be the game changer. Thank heavens. A revision with no joycons is a horrible idea. @PipeGuy64Bit Why would a Switch Pro be annoying? I'd buy 1. I'd be excited! I love my New 3DS XL with it's additional RAM, faster processor, bigger battery and better screen. I don't believe there will be a Switch successor just yet. Why would Nintendo want to replace or lower the price of a console that's currently selling really well at its current retail price? When sales really start to wane several years out, then that'll be the time to ask these questions. But I do think a slight Switch hardware revision akin to the N3DS, DSi, PS4 Pro, etc. is possible at this point. Maybe not this year, but I could definitely see it happening. I rather believe the Nintendo President then Analysts. Analysts are using voodoo markets to justify their own failures. Some of those analysts were probably the Nintendoomed analysts as well. You always have to read between the lines with Nintendo. He says they aren’t planning a successor. That leaves plenty of room for iterations. Like @progx says, I see them issuing constant revisions. They’ve even alluded to this in the past. It also allows them to build a software ecosystem as again they’ve said they wanted. Switch is the sweetest hardware spot Nintendo could have hit, they won’t want to throw away a winning formula. @electrolite77 "You always have to read between the lines with Nintendo. He says they aren’t planning a successor. That leaves plenty of room for it"
Let's actually say what he said. "we are not considering a successor or a price cut at this time." This is quite different from what you just said. And read the last part "this time". So what does he mean exactly by "this time"? That is a very loose timeline. @electrolite77 "Switch is the sweetest hardware spot Nintendo could have hit, they won’t want to throw away a winning formula." That a understatement considering all the Nintendoomed whiners from before. It got to where it is without 4K or high power GPU and still could out sale and out play the competitors. I would put money on them doing exactly that. Quote me properly. Don’t chop the end off one of my words to give it a totally different meaning. @electrolite77 "you mean the first part quoted wasn't you saying it"
Nothing was missed for the first lines so your trying to backtrack now. Maybe you should also quote completely what he said not chop off what he said. So pointing out your obvious mistakes. Don't recall here's his complete reply without chopping reinterpreting what he said. "Furukawa: "It is an extremely ambitious, but worthwhile achievement. So, we will maintain this goal. Nintendo Switch is our primary sales objective, and we are not considering a successor or a price cut at this time."" You can't trust this kind of things anymore. They said too that MP4 development was going really good and now they come out an say that they are scrapping it since it wasn't good. @electrolite77 That would be my bet as well. I'm also hoping for it. I think it would be a great move by Nintendo. Personally, I never remove my joycon (Even when docked) and while I would get use out of a second Switch, my wife and I get by just fine with sharing. A cheaper version without the excess stuff I don't need anyway may convince me to buy a second soon rather than later. @SwitchForce Unless you genuinely do not realize you misquoted @electrolite77, you absolutely completely changed the meaning of the post you "quoted". You cut part of a word off to give it a totally different meaning. Don’t do that. Similar here, my 4-year-old is getting interested. I still have my 2DS but it doesn’t get his attention at all. He’s far more chance of getting his own Switch if there’s a more durable Switch with less detachable bits. Obviously I shouldn’t extrapolate my own experience too much but I think it makes total sense for the handheld market. Except they have done that a lot. Gameboy Pocket, GBA SP, DSI, New 3DS etc. That's good! If it's already selling why change it? The statement given also functions as a "Hey investors, here's where we are with this..." type of thing, but info changes all the time, so I just take this with a grain of salt. @invictus4000 Why would you say that? Just because it's not your ideal way of playing? For me (and me alone) the joy cons are horrible. If I could buy a Switch that was $180 because it wasn't bundled with a dock and doesn't have the mechanism that allows removable joy cons, and doesn't have a cart reader (I far prefer buying digital) but it still could be put in a dock if you already have 1 (I already have 2), I'd buy it without hesitation. I do 80% of my gaming on airplanes during work trips or in cars so while it wouldn't be appealing to you, it would be to me and maybe others as well. It will sell like hotcakes!!! I got a Switch because all my friends got one and none of them would shut up about how much fun it was. I know this is ancediotal but not a single one of us plays tabletop or console mode. It's also way too big and fragile to take out of the house, unless you have a backpack or something, and the battery only last like two and a half hours anyway. For us the beauty of it is that we don't have to take the TV away from anyone else to play a game and it's a frictionless transition between playing and not playing. You can play for 45 minutes and then hit sleep and throw it on the charger at a moments notice, knowing it'll be right where you left off when you're ready to play again. I know that for a lot of people the Switch's console mode and detachable Joycons have some utility but I think there is a sizable market for people who see them as more of another weird Nintendo compromise we put up with for the games and would welcome a simplified, handheld only iteration. Especially if it was smaller, cheaper and had a better battery. The Switch is selling great and is on track to be one of Nintendo's most successful consoles in the company's history. They would be fools to mess with it. @PipeGuy64Bit it's only annoying to those that bought a Switch. For those that have held out, the thought of a Switch Pro is super enticing. Those stating that Nintendo would be fools to do this due to the success of the current Switch, I don't follow the logic. Does Apple stop building iPhones and iPads because the current iteration is selling like hot cakes? Apple and Nintendo are different companies with different philosophies and customers. Apple's business practices would probably cause Nintendo to go bankrupt. So, the 8th generation Switch is going to compete with the 9th generation PS5 and Anaconda? Nice, no porting those games onto it! I blame the journalists, or who ever is writing this stuff. Someone trips and scratches their knee, and going along the news chain it arrives at the other end that the person is on crutches. Successor means goodbye Switch, hello 4k 3d home console with glasses included. Switch Pro or Mini is a Switch update. It makes zero sense to price cut or release a Pro version now or anytime soon. The ‘analysts’ are spreadsheet specialists with no understanding of gaming or Nintendo. PlayStation and Xbox are spec-chasing machines, whereas the Switch is the antithesis of this. Switch is here for the long haul. I wouldn't expect an updated/slim version before 2021. Whatever iteration they come up with, it will still be backwards compatible. It's only been like 2 years that the switch has come out .... Chill. Switch is printing money and everyone is grabbing one, I doubt that they will release something and have a shortage again. I feel that in the next 2 years we may start to see XL versions of the switch, maybe updated internals (I doubt it though). Maybe in 3 years see the "pro" version of the switch . Yeah there’s not much precedent with their Home systems (Wii Mini?) but now Sony and MS have gone down that path I can see Nintendo doing the same. I really think they want the Switch ecosystem to last a long time and that means iterating the hardware. You know it’s doing well when you’re in a pub and you see 3-4 dudes sitting playing a local network battle in some shooter. I’ve never seen that before but I have now. The thing is for all this talk of a lack of power, it’s still selling like hotcakes. People have bought into the proposition and are having fun, it’s almost like the majority of users aren’t that bothered about power, they’re enjoying being able to play anywhere. It’s the laptop of games consoles. Right, this is very carefully worded. A revision, like a smaller version to supplant 3DS is not a successor. Honestly, a Switch Pro that is 100% back and forward compatible with Switch wouldn't be a successor either. I didn't think of the different bundle style, but that is a way to offer a lower cost option without a price drop, too. Also: End of the year, Holiday season, all bets are off. They want to price drop then, they will. In fact, I'd put this comment in context of reaching the goal, which is coming up soon (April?). After that, Nintendo can pretty much do what it wants and this statement stands. Personally I prefer != to <> but I'm just impressed you used programming symbols. Finally! A Shut the f$#k up to all the rumours! Terrible. Nintendo consoles used to always be $100.00 less than the competition except when the GEN was $50 less than the SNES. I remember when the GCN was $49.99 when the PS2 was $149.99. And the N64 cost less than PlayStation at $99.99. And the Wii was far cheaper than the $599.99 PS3. That's really good to hear, since I just got myself a Switch recently. That reminds me the 3DS XL situation where Nikkei wrote an article about upcoming revision (with larger screen) and Nintendo responded that the rumours were false and it’s nothing but speculations ... only to announce it few weeks later, during a Nintendo Direct. GOOD!!!! There is no need for a new generation till at least 2023. We have all the hardware we need. Indie games at the moment do not need anymore hardware, lazy coding compression techniques don’t need better hardware, we literally have all the graphics we need right here right now. I don’t want to see new hardware until graphic engines make you put them side by side and say............. Wow. THAT is actually noticeable, not... some textures, some shadows, some extras hairs on a head. Graphics have reached a plateau and now we need programmers to catch up to hardware availability. Do you remember when we had SNES and we went from Mario world, to Mortal Kombat, to Donkey Kong Country, to Star Fox and allllllllllll that came from the same hardware? Programmers relied on hardware less and their ingenuity more. The Saturn was AWESOME!!! End of discussion. “But Will, it was inferior and lacked third party support! ?” You can stop you’re internal dialogue, you’re wrong, get over it. OK?...... OK. When decent programmers got hold of Saturn hardware they took a machine supposedly inferior to Playstation 1, and gave you games closer to Playstation 2. Don’t believe me? Search for 5 seconds for a video on Shenmue (or Virtua Fighter 3) running on Saturn..... watch it...... and then shhhhhhhh. Hardware only takes a game so far, then it leaves the gauntlet to programmers to create what they will. Demanding Gflops, RAM and graphics processors only enables your art department, not the game. Hardware today is MORE than proficient to deliver what we need. Give this generation of programmers chance to evolve and THEN give them new hardware. Nintendo isn't going to announce a price cut during some random interview, and they certainly won't announce a friggin' Switch successor this soon. @patbacknitro18 NES Pro - 1987, SNES Pro - 1993, N64 Pro - 1998, Gamecube Pro - 2003, Wii Pro - 2008, Wii U Pro - 2014. Uh no, Nintendo doesn't usually release updated console models 2 years after release. @Crono1973 They've released different variations of systems, though not necessarily "Pro" versions. They've tried making the N64 disk drive, which failed. They've made updated Wii models that could run games like Smash Brothers Brawl, which couldn't work on some older Wii systems. As well as a Mini version of the Wii. @PipeGuy64Bit it doesn't put an end to it. Nintendo have the Switch Pro designed with Tegra X2 ready to go when the time is right. They aren't going to harm sales of the current model by telling us they'll have revised models ready by the end of year. @Crono1973 you're assuming switch is a console - it is 100% NOT a console. It's a handheld that DOCKS. @KingSandyRavage I don't know how Segas bull videos got involved here. Those games didn't run at all on Saturn, Sega sped up the videos, only adding stupidity to the console wars. Saturn was designed for 2D, yes there are some nice 3d examples running on it but nothing that touches the PS1 let alone N64. Other issues: those were frame by frame animated tech demos with no user control and the Saturn couldn't even run them at a decent speed. @liveswired wow. Someone doesn’t like being pointed out they are wrong. The demos shown weren’t interactive but the games were fully functioning. Please don’t try and throw Playstation 1’s 3D capabilities into the ring here. It was a joke. Neither the Saturn or Playstation really presented a decent 3D world, the first machine to successfully present a navigable 3D environment was the N64. Then not matched until the Dreamcast. The only console that pulled it off in between the two was the Saturn, but was superseded by the Dreamcast before the games released due a catalogue of other internal catastrophes. @liveswired It's primarily a console. Their current handheld is the 3DS. They always start with the next project when a console is finished. If they were they wouldn’t announce it until right before release. Otherwise it would stunt sales of the current model when people decide to wait for the new sku. @sleepinglion Often console revisions are cheaper to manufacture than their predecessors. Programming symbols? That's like 3rd grade arithmetic. But I did start programming on my first home computer in 1983. (which I only remember b/c my well-to-do uncle bought it for me for a HS graduation gift, which was in 1983). That computer was basically a keyboard w/ a cassette player built in hooked up to my TV using some early form of BASIC, but I did program a few things with it. And speaking of programming, I need to tell somebody and you're one of the few parents I know who I talk to about computer stuff, my son the HS jr. got a 1460 on his SAT. Not perfect, but he's 99% percentile, and his school average is #3 out of 429. He's basically the only thing I've accomplished in my 17 years of being a stay-at-home dad so I need to enjoy it. We're looking into Binghamton "the Ivy League of SUNY" Stonybrook, Yale, Princeton and Maryland at College Park. He's the lead programmer this year on his FIRST Robotics team robot, so that should help. You know of any lesser known schools feel free to share. He's not quite MIT material, or Carnegie Mellon, but I think he can make it in Ivy League. My problem is I know the big names, not the little lesser known ones. He's getting tons of mail after that SAT score, but it all looks alike. We're also maturing him quickly by having him watch Game of Thrones w/ us as we rewatch before season 8. I thought he might be a little too young for it - 16 in Sept -but my wife insisted. Not a fight I wanted to have. Oh, when he finally gets his own Switch, probably when Pokemon releases, I'll probably be hitting you up for how to manage 2 Switch. I know there's tutorials for porting the account, that's a physical act I can do, I mean handling it in the house w/ save files, online and such. When he's off to college he's on his own. Sorry so off topic, but as I said I had to tell someone. Time to cook dinner, my lessor life achievement. @Crono1973 it isn't though. It's a handheld tablet. 3DS was just having an extended farewell. @KingSandyRavage I can't agree with any of that. Yes it had two CPU's, but they were designed for powering 2D graphics. Like PlayStation Saturn pretty much relied on tricks to create 3D. Sega's ex President of America has even said Sega Japan didn't believe 3D would take off in the home market and focused on creating the best 2D machine around. Hence why they gave SGI the boot. @liveswired Switch replaced the Wii U, not the 3DS. @Crono1973 It replaces both as Nintendo have changed direction and have not made a home console. @liveswired The Switch obviously hasn't replaced the 3DS. @Crono1973 It has though. Nintendo were just giving 3DS a long, slow send off, there will be no more DS products. Like when DS replaced GBA, Nintendo called it the 3rd pillar just incase it failed. Lets not forget, when Switch was announced it was receiving as much hate as Wii U, it was set for failure...Eurogamer single handedly saved it and turned the tide by doing tech teardowns and refocusing attention on it being the most powerful handheld ever - which it is.